Bangaloreans who have been a witness to the dramatic urbanization of the city, and a subsequent decline in the green cover, lament over the loss of some of its notable heritage buildings, such as the Government Press, the residence of Late Sir M. Visvesvaraya, and of course, the Victoria Hotel. Before the Late Sir Donatus Victoria bought this property, the place housed a reading room, called the Bangalore book society, where Sir Winston Churchill is said to have been a regular visitor. Victoria Hotel was the kind of place one went to, to spend an entire day, starting with breakfast after Sunday mass, and going through to dinner, all accompanied with their favorite tipple. It was a time when most of the diners and the servers knew each other by name and it was a close-knit family of sorts. Salvadores, the restaurant on the 5th floor of the building which now stands in its place is run by the same management that ran the erstwhile Victoria Hotel and seeks to bring in a similar kind of familiarity and old-world charm, along with a fine-dine experience. This is the kind of place which will evoke strong emotions of nostalgia, joy and contentment, no matter which age group you belong to; Salvadores manages to retain this old world charm in a modern setting. As you enter here, the sheer grandeur of this place will make you forget that you are in the same building which houses a mall. This place has an understated elegance that might not draw the attention of a casual observer, but as you get accustomed to the place, the attention to detail becomes apparent. From the beautifully folded ‘Lotus Leaf’ shaped napkins in glasses, the multitude of gleaming cutlery,their beautifully-crafted crockery (made by the famous Japanese Noritake brand) . and stemware neatly set out on the table, the lovely wine cellar-like flooring and the charming section in the corner where a gleaming upright piano stood, ready for an audience. The soothing strains of Dean Martin, Frank Sinatra, Nat King Cole and Louis Armstrong, amongst others, compliment the entire dining experience and virtually transport you back in time! As you venture outside the lovely dining room, you are greeted with a magnificent, panoramic view of Bangalore in all its green-glory, with the occasional metro speeding by in the background. The beautiful Al-Fresco seating is perfect for couples looking for a romantic candlelight dinner, or to enjoy a glass of wine, as you witness raindrops gather pace in the distance. Truly sublime! As you settle down for your meal (we chose the indoor dining section), the rather streamlined menu catches your attention. Most of the items on the menu were classic dishes, including favorites like Pork Chops, Escalope, Irish stew and Fish Pies. 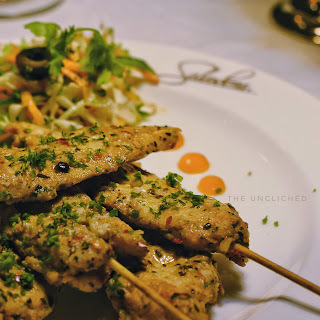 The best part of the menu is the fact that each of these dishes are carefully chosen to match wines that they have in-house, and I was pleasantly amazed at the wine-food pairing knowledge of the servers here. 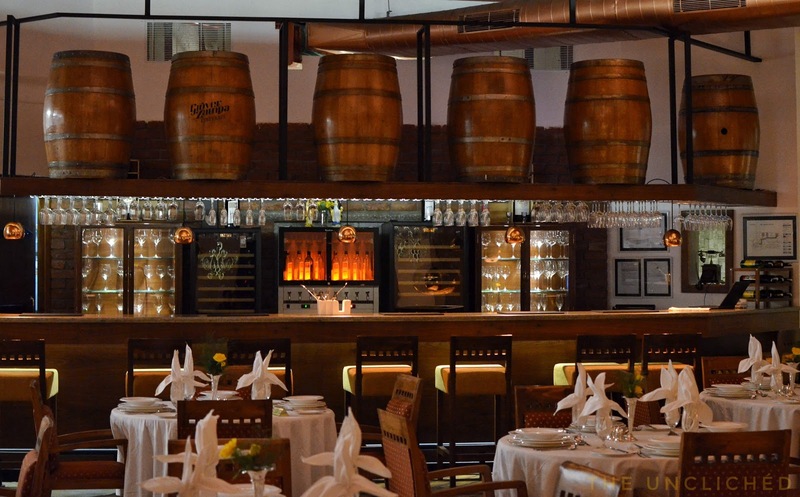 Another interesting thing about this place is that they have temperature controlled wine storage and dispensing machines (made by the renowned French company, Eurocave), so that the wine is served to you at precisely the right temperature. They have an interesting selection of Indian and, both, "Old World" and "New World" wines from France, Germany, Italy, Australia, New Zealand, Argentina and Chile. 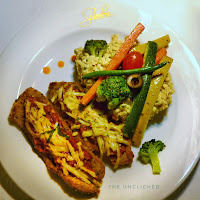 The food here is absolutely top-notch, and each of the dishes that we tried here were done to perfection, and plated beautifully in a classic sense. The herb infused grilled tenderloin steak was exemplary. Cooked medium rare as per my preference, juicy on the inside, slightly-crispy on the outside and served with a lip-smacking pepper sauce, this was hands-down the best tenderloin I have had in town. Another classic, the chicken parmigiana was spot-on as well. Beautifully cooked breaded-chicken breast pieces topped with shredded parmesan cheese, served with a deliciously- creamy mushroom risotto and grilled veggies. Excellent! 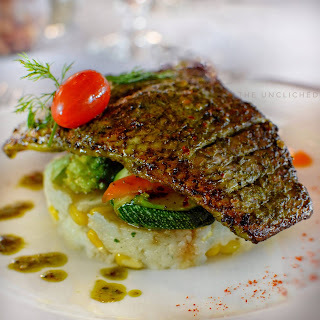 The Grilled Chimichurri Fish steak was another item that we liked immensely. A lovely fillet of fish, marinated in a mixture of lemon, cilantro, oregano and chili and grilled to perfection with a few additional condiments. The lovely fish steak was served on a bed of creamy garlic potato mash and buttered legumes. The fresh flavors of cilantro and parsley, the slight heat of the chilies was perfectly offset by the acidity of the lemons. For dessert, we went ordered the highly recommended Chocolate Old Monk Rum Tart and we were not disappointed. A crisp tart with a lovely, velvety chocolate-rum ganache filling, which was the perfect balance between sweet and bitter. This was a beautiful rendition! We also tried the Trifle Pudding, which was another classic. Layers of a lovely-blueberry jelly, mixed fruit custard and fresh cream, another delightful dessert done right! 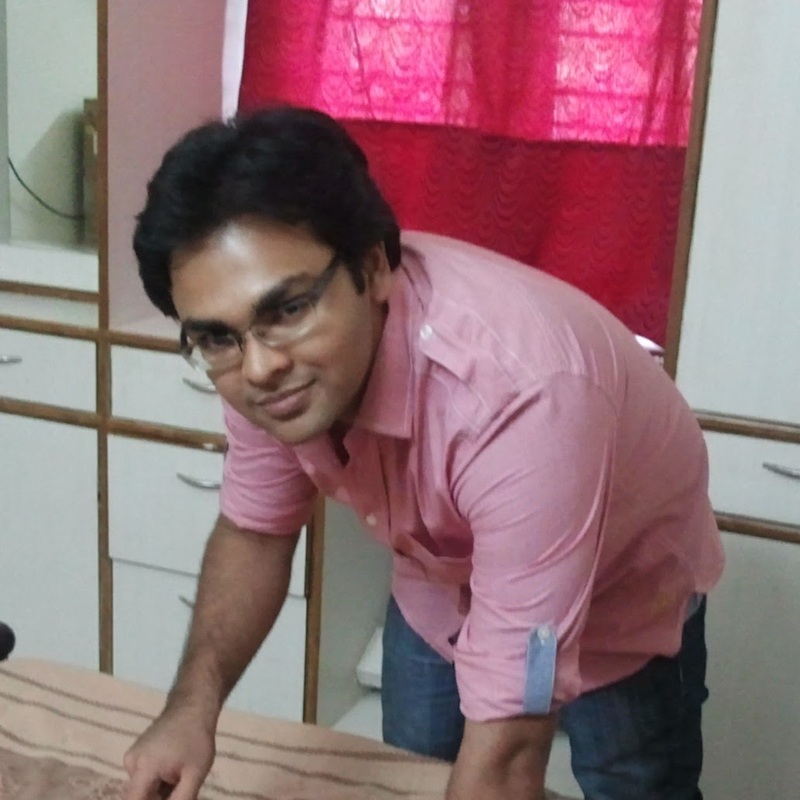 A special word of mention for this service here. The servers here treat you with the kind of familiarity that you might expect from an old friend, and yet, it is the perfect balance between helpful and discreet. Only the required cutlery is placed in front of you, and the dishes are cleared out with ease, at exactly the right time. Exceptional service. 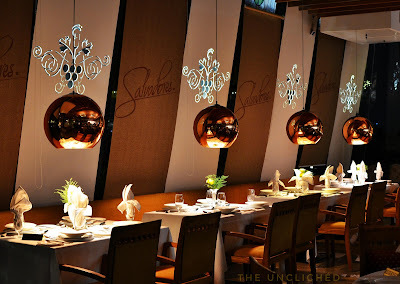 Nostalgia is a powerful emotion and dining at Salvadores will definitely evoke memories long forgotten and forge new ones of the exceptional dining experience here. Warm hospitality, attention to the tiniest detail, wine served in the correct stemware at precisely the right temperature and of course, exceptional food will ensure that you keep coming back to this place for more! P.S. : Their set menus are very well-crafted and excellent value for money. Also, their breakfast spread sounds interesting. Coming back here soon!